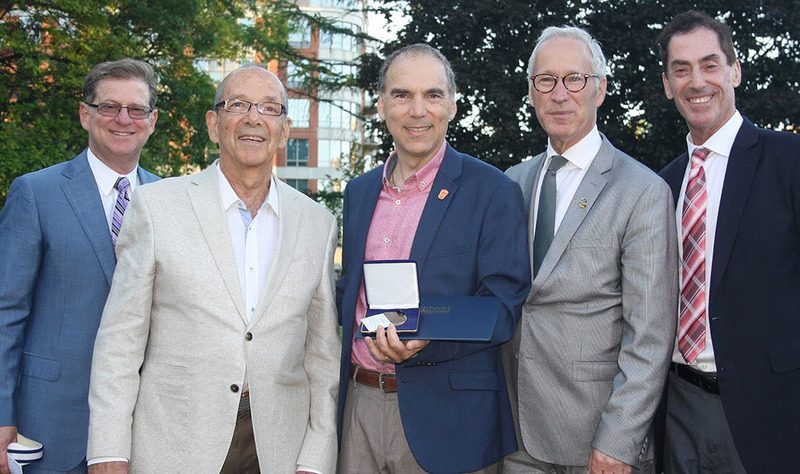 Glenn J. Nashen (centre), with his D’Arcy McGee Medal of Citizenship, is congratulated by (from left) former MNAs Robert Libman and Lawrence Bergman, current MNA David Birnbaum and Cote Saint-Luc Mayor Mitchell Brownstein. 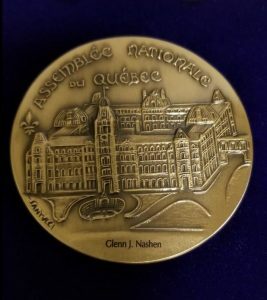 Glenn J. Nashen, Associate Director of Communications and Media Relations for CIUSSS West-Central Montreal, has been awarded the National Assembly’s D’Arcy McGee Medal of Citizenship in recognition of his many contributions to the lives of Montrealers in and beyond the provincial riding of D’Arcy McGee. 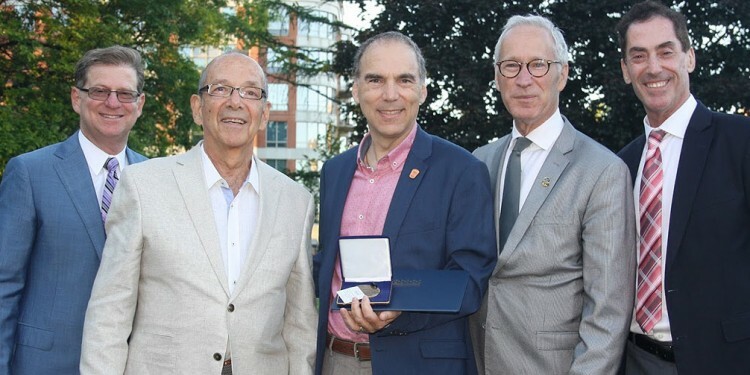 Mr. Nashen, a former long-standing City Councillor in Cote Saint-Luc, accepted the medal on June 19 from David Birnbaum, MNA for D’Arcy McGee, in a ceremony at City Hall. In a video message, Premier Philippe Couillard praised Mr. Nashen for his “years of devoted service as a Cote Saint-Luc City Councillor, highlighted by your visionary leadership in creating a ground-breaking Emergency Medical Services team, as well as a unique volunteer citizens’ patrol, which are deeply appreciated by the community. Mr. Nashen has had a life-long interest in emergency services, which was among his key portfolios when he served as Councillor from 1990 to 2001 and from 2005 to 2017. He began volunteering in 1979 as a First Responder for Cote Saint-Luc’s Emergency Medical Services (EMS) and was a part-time Emergency Medical Technician with Urgences Santé during the 1980s and ’90s. Mr. Nashen says he is particularly proud of his key role in transforming the EMS into a modern, 24/7, all-volunteer, life-saving operation. He also saved it from closure in the early 2000s, a time of uncertainty when Cote Saint-Luc had to merge with the City of Montreal, only to de-merge later. Today the EMS responds to 3,000 life-threatening or potentially life-threatening calls per year. Also created and launched by Mr. Nashen in 2006 was the unique and innovative volunteer organization, Citizens on Patrol, which he built into an organization of nearly 100 participants who keep an eye on the city in marked patrol vehicles, scooters and bicycles. The volunteers assist and inform residents on matters of public safety, and they alert the authorities to any emergencies they come across. This public safety service, unique in Quebec, is greatly appreciated by area residents. Since joining the JGH in 2001 as Director of Public Affairs and Communications, Mr. Nashen has been instrumental in enabling the hospital and, later, the CIUSSS to keep pace with rapid and constant changes in web and social media, branding, media relations and political affairs, while providing news and information about the JGH and the CIUSSS to the public and members of staff. 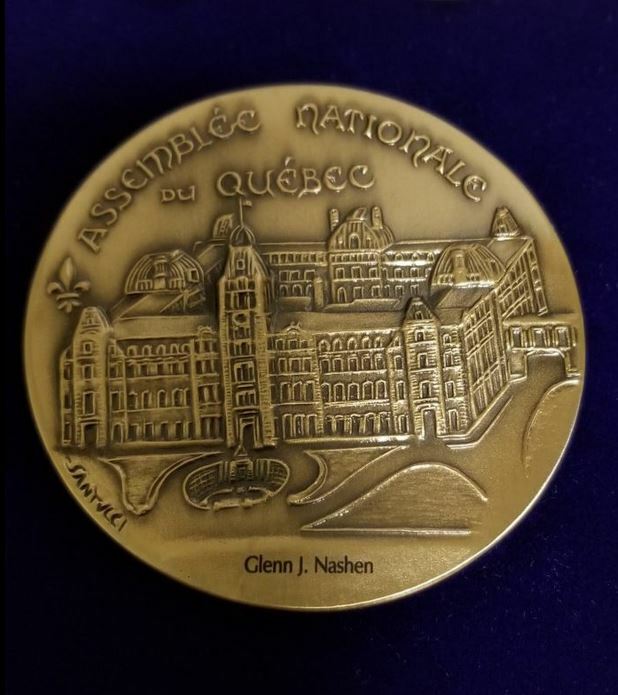 In addition, from 1995 to 2000, Mr. Nashen worked for Federation CJA where he headed the Young Leadership Division and founded the Jewish Chamber of Commerce. From 2000 to 2001, he was Executive Director of Alliance Quebec. 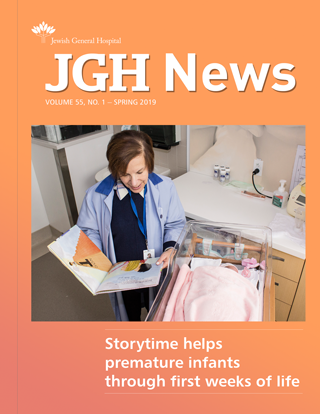 Mr. Nashen is married to Dr. Judy Hagshi, a family physician at the JGH.